In this inaugural Hometown Hero edition of the Ocean Mist Power Hour, Misty Young talks with true Hometown Hero Linda Schreiber about great resources for local, sustainable, nutritious food, the joys and woes of homeschooling, student scholarships, services available to seniors, and free shoes for anyone! Linda was raised in southern California and is a graduate of Fresno State. She holds a business degree in computer science. She and her family have made their home in Brookings for a decade and a half and have made our town even better. Linda Schreiber sees ways to serve and raises her hand and steps up with a loving heart and an energetic spirit. She credits her mother and grandmother with giving her a heart for service. Learn how you can become active and helpful to your neighbors and community and reap the personal rewards of kindness and compassion. YAY! Kathleen! Thank you for listening, it’s wonderful to interview people who are active and interested in serving their neighbors and community. 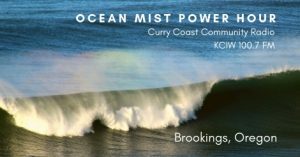 I’m having a blast with the Ocean Mist Power Hour!